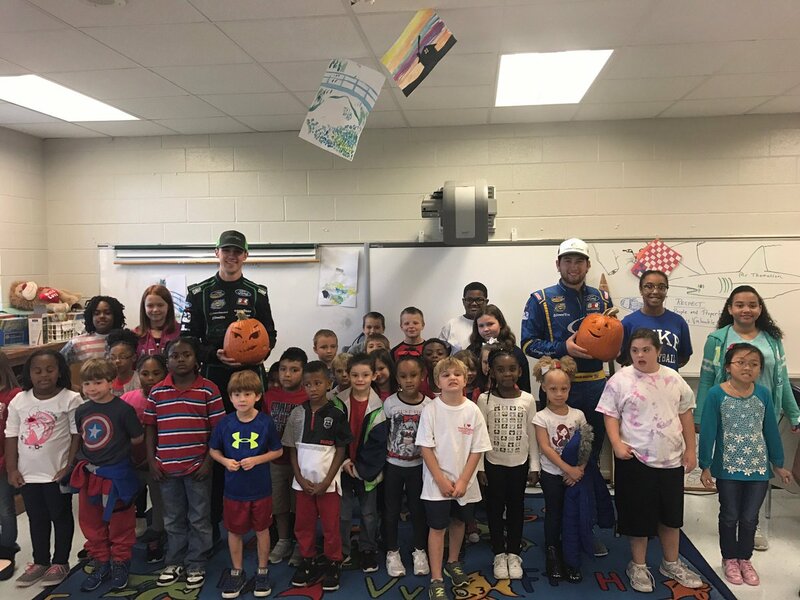 First graders at Rich Acres Elementary School in Henry County got some help carving pumpkins Tuesday when Brad Keselowski Racing drivers Chase Briscoe and Austin Cindric dropped by and visited an art class. The two drivers were on hand to promote Saturday’s Texas Roadhouse 200 NASCAR Camping World Truck Series race at Martinsville Speedway. For the drivers, getting a chance to spend time with the students in a relaxed, fun environment is a great opportunity to help build the sport for the next generation. Briscoe, who had never carved a pumpkin before the trip to Rich Acres, felt the same way Cindric did about using the trip to Rich Acres as a way to grow the sport’s fan base. For Rich Acres Principal Renee Scott, having Cindric and Briscoe visit with children who might not otherwise get the experience means a lot to the school. “It was touching to me,” Scott said. “I feel like Chase and Austin did a really good job trying to interact with the kids on a personal level and the kids really enjoyed the opportunity to talk to them and tell them what’s going on in a first grader’s mind. It was really fun to watch them interact. The Texas Roadhouse 200 presented by Alpha Energy Solutions is Saturday, October 28. The race is the first race in the Round of Six in the NASCAR Camping World Truck Series Playoffs. If a Playoff driver wins, he would be the first to lock himself into the Championship Race at Homestead-Miami Speedway. Last year, Johnny Sauter won the race en route to the Series Championship. Tickets to the race are $35 for adults. Kids 12-and-under are admitted free. Tickets are on sale now and can be purchased by calling 877.RACE.TIX or online at www.martinsvillespeedway.com.